The challenges our societies are facing in respect to climate change and more generally to impact of weather and climate hazards on their activities are growing every day. Tackling those challenges requires strong actions at all levels: political, technical, human, global, local. Meteo France International is a small but highly motivated actor in this context, deliberately promoting a stronger role of NMHSs in their country. Indeed NMHSs need to boost their plans to become major players and serve the government policies locally. In order to help them meet those objectives, MFI relies on innovation, in every sense of the word! Innovative systems and solutions: MFI is reshuffling its whole range of systems and proposes first-in-class web-based solutions able to implement any working organization, to reduce system administration hassle, and maximize cross sectorial benefits locally. Innovative approach: MFI is continuously promoting its DBO (Design Build Operate) approach towards NMHSs, governments and development partners, as one of the most effective solutions to maximize effectiveness of hydromet investments and therefore socio-economic benefits of modernization initiatives. Innovative public private partnerships: MFI is actively involved in Global Weather Enterprise Forum activities and in the gatherings of WMO and development partners, for promoting the interest of public private engagement, with the sole goal of strengthening the role of NMHSs worldwide and matching the growing expectation for better warnings and services. 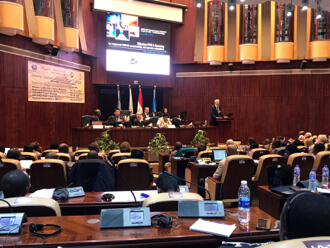 MFI and the ASECNA (Agency for Air Navigation Safety in Africa and Madagascar) have been collaborating for many years, working together towards a safer African sky. With innovation and capacity building in line of sight, the two organizations have recently signed a 5-year partnership agreement meant to facilitate their common efforts to improve the quality of the meteorological assistance to air navigation. The partnership includes training programs, share of expertise in collaboration with Météo-France and other consultancy and engineering services to pursue the development of ASECNA's capacities. Maintaining our system offer at the highest international levels and making sure it constantly meets user's expectations is a strong concern within our technical teams. We work every day for more universal solutions, focusing on easy accessibility, proven interoperability and optimized usability. complex situations and produce accurate weather forecasts and warnings, in a timely manner. Dedicated plug-ins for specific users such as aviation or armed forces are also available. SYNERGIE-WEB is now starting its operational life with first implementations currently taking place in Haiti, Angola, Nepal and Malawi. To follow up with good news, we are also proud to announce the release of our new universal observation data collection system: OBSMET! Its strength lies in its capacity to collect, monitor and quality-check data coming from heterogeneous networks. It is also fully WIGOS compliant, allowing its users to participate to WMO's global initiative to improve exchange of observation data and metadata. Haiti's national hydromet service is the first entity to host our brand new OBSMET, and implementations are on their way in Andorra and Angola! continent, is an outstanding illustration of convergence between public and private sectors for the sustainable benefit of a whole country. Year after year, MFI's turnkey approach proves itself to be the most relevant method to strengthen NHMS' capacities, all along the meteorological value chain. In 2013, the Government of Nepal and the World Bank launched the Building Resilience to Climate-Related Hazards (BRCH) Project aiming at transitioning Nepal&apos;s hydro-meteorological services (DHM) into a modern service-oriented ecosystem that will build resilience today, as well as adaptive capacity for the future. Among the objectives of this project, the improvement of the accuracy and timeliness of weather forecasts and warnings were high on the list. In this context, MFI was selected last September to provide a global forecasting / production solution composed of 3 components: SYNERGIE-WEB (forecasting workstation), AEROMETWEB (pilot briefing) and METEOFACTORY® (PWS/EWS system). MFI will also be delivering a mobile application intended for general public, which will include a hydrological section. The project was officially launched in Kathmandu last November. It is now in a factory engineering phase taking place in MFI's headquarters in Toulouse. Shipment of all equipment is planned end of April, followed by a two-stage deployment phase: first in DHM national center and Katmandu airport, and then in 5 regional centers. 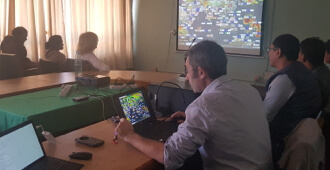 Summer will be dedicated to a comprehensive training program including technical courses on MFI's systems, as well a more thematic interventions ensured by meteorology experts from Météo-France. The project is due to be concluded by end of August.